Mercy Ships volunteers from 40 nations. Don Stephens grew up on a Colorado ranch and had never seen the ocean. But as a theology student on a mission to the Bahamas, he had a vision: he wanted to use the seas to bring medical services to some of the world’s most desperate people. In 1978, that dream set sail when Mercy Ships launched its first surgical hospital vessel. For Stephens, it was the beginning of a lifelong quest to use the oceans to provide access to people who have never seen a doctor or dentist in their entire lives. “Ships make a tremendous amount of sense in bringing medical service to underserved populations,” Bobby Baker, director of corporate relations with Mercy Ships told HCB News. The Mercy Ships seagoing surgical ship runs on donated medical supplies and equipment – and staffing. There are 400 crew volunteers from 40 nations on board, from deck hands to surgeons, who volunteer their time in service of the medical mission. For example, volunteer stints for biomed techs are three to six months, three months for medical lab techs, while radiology techs serve four weeks. 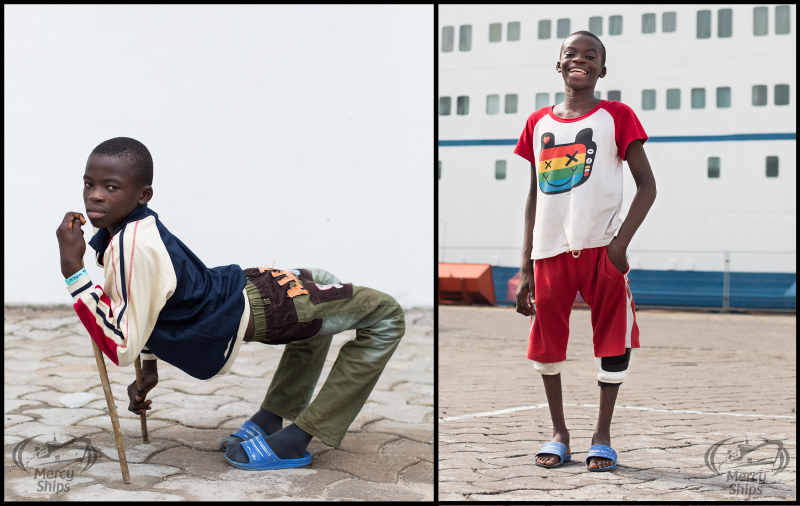 on Mercy Ships to straighten his legs. Its current vessel, the Africa Mercy, is the largest of the four vessels operated over the past 40 years. Stephens, his wife, and their four children lived on board its first ship for 10 years after Mercy Ships commenced operations. Baker said that the organization now focuses exclusively on the African continent. All of the groups HealthCare Business News spoke to for this article have a top 4-star or 3-star rating at Charity Navigator, and each of them has proved to achieve impressive, measurable results. In the past fiscal year, Project C.U.R.E. sent 181 shipments of medical supplies and equipment valued at $61 million to 50 countries. This included redirecting 3.2 million pounds of usable medical surplus that probably would have been disposed of by U.S. hospitals and medical manufacturers. Project C.U.R.E. volunteers contributed 160,000 hours collecting, sorting and inspecting the medical donations, as well as packing the outbound cargo ships. The group's staff spent 324 days working in the field, with 62 medical and other volunteer staff providing free care to 7,300 patients. The organization trained 154 nurses, midwives and birth attendants in four developing countries.